The history of St. Luke Catholic School is closely associated with the beginning of St. Luke Parish. 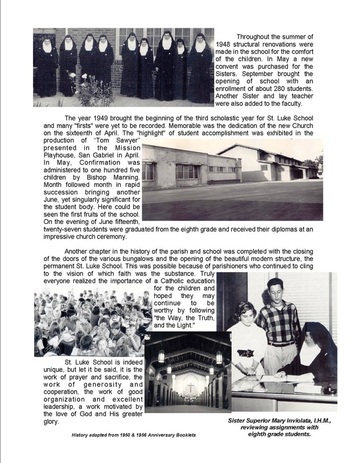 In July 1946, the parish was established and in September 1947, a temporary school was founded. The first pastor, Reverend James Hourihan, and his parishioners aimed at fulfilling the words of Jesus, "Suffer the little children to come unto me, for of such is the Kingdom of Heaven". Realizing the advantage of a Catholic education for their children, they deemed no sacrifice too great to accomplish the founding of a school. It was out of the question to construct a permanent school because St. Luke Parish was heavily in debt. Plans for a temporary school were drawn up. 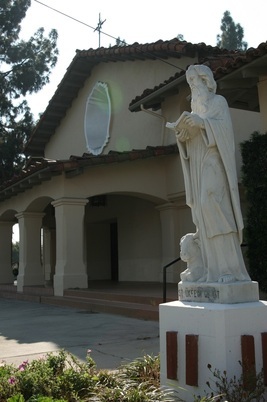 Father Harry Meade of North Hollywood, who had just constructed a beautiful school and had at his disposal frame classrooms, which he had used for a number of years, offered them to the people of St. Luke Catholic Parish without any recompense. In due time, they were moved on the property at Cloverly and Broadway, and the men of the Holy Name Society worked to remodel the rooms. One hundred eighty children were enrolled in the first six grades. The Sisters of the Immaculate Heart of Mary accepted the invitation to staff the school. On September 13, 1947, Sister Marie Christine was appointed principal. The rest of the staff was composed of Sister Mary Joseph, Sister Annette, and Mrs. J. H. Roben. In 1956, a new wing of the school was completed. It had to be built due to increased enrollment. Fourteen classrooms were in operation, eight in the old wing, and six in the new wing. Within two years, sixteen classrooms were used by over 800 children. It was the hope of the parishioners that these facilities would adequately care for the educational needs of the children of St. Luke Catholic School. In 1957, grass was planted and a fence was constructed along Live Oak and Cloverly for the safety of the children. On June 30, 1969, the Immaculate Heart Sisters, under Sister Anita Caspary, withdrew from St. Luke Catholic School. The Sisters of the Immaculate Heart under Sister Eileen MacDonald agreed to continue to staff the school. The Sisters were assisted by a qualified and able lay teaching staff who served a total enrollment of approximately 300 students in grades one through eight. As time went on, there was a drop in enrollment. The Archdiocese asked that where there were double classes of each grade, one class be dropped each year. Since 1978, there have been single classes for grades 1-8. In 1988, an extra classroom was converted to a computer lab, with the Writing-to-Read Program beginning in the spring of 1989. In 1990, the first lay principal in the school's history, Mrs. Mary Higgins, was appointed by Reverend Thomas King, the pastor. This marked the beginning of St. Luke Catholic School being staffed entirely by lay personnel. In 1991, the school was renovated, including the installation of air conditioning, new lighting, paint, carpeting, and windows. In addition, several classrooms were converted to establish a science lab, an art room, and a staff workroom. Also in 1991, a kindergarten was started. In the same year, the Sisters of the Immaculate Heart of Mary withdrew from their residency at St. Luke Parish, and in 1992, the convent was converted to a parish administration center. In November of 1993, the new parish hall opened, and the school's new asphalt playground and a sand play area were completed. In January of 2000, the playground was brought up to code by replacing the sand with a rubber-based padding and new playground equipment was installed.In September of 2012, the Transitional Kindergarten commenced. Since the foundation of the school in 1947, St. Luke School has been committed to quality Catholic education. Our principal Ms. Yvette Jefferys, dedicated faculty and staff, continue to minister to the children and the families of the school community.